This issue has been on my mind for the last two weeks. Today it wrecked me! I’ve been identified as funny, quick-witted, and sarcastic for the majority of my adult life. I’ve taken great pride in bringing people to tears with laughter. I’ve especially enjoyed occasionally catching someone off-guard after taking a drink of something and resulting in spraying the contents of their mouth EVERYWHERE. Classic. Wikipedia defines Sarcasm as “a sharp, bitter, or cutting expression or remark, a bitter gibe or taunt”. This is what I’ve been proud of?! A tool of destruction, now a characteristic making up what others call “me”. Is this the ME I’ve wanted to be? Is this the ME I’ve been called to be? This response was followed by frantically trying to remember any time my words may have hurt or caused insecurity in someone. I was pretty successful, but as the minutes went by I realized something. Even if I had the ability to remember each instance and reach out to them and apologize, how many were able to mask their wounds until they escaped my presence? How many? I immediately went to Ephesians 4 where I found the following verses. Read them again and ask yourself where you think sarcasm fits into your life. How about your ministry? How about your relationships? I’m sure you’ve figured it out by now. It DOESNT! We know by these passages that our words are to be used to encourage others. The opposite is, as 5:4 states, “..not for you”. Now stay with me here. I AM THE WORST OFFENDER! I have been in ministry for 7 years now. A worship leader, youth volunteer, and now a worship pastor. 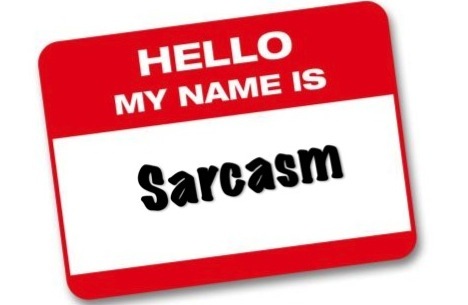 I have been sarcastic with students, adults, pastors; you name it. It brings me to tears to think that students may be afraid to confide in me because of my “humor”. To be apart of a ministry that promotes a welcoming and loving environment and then act the way I have, leaves me full of shame and regret, but here is the beauty in all of this. GRACE. I have the opportunity to be the change I seek; to stand and fight the social parasite I helped create. Jesus did not come to earth to condemn us, but to save us. This truth and the love that we see through it applies to this situation as well. He used a tragedy (used, not caused) to open my eyes to an area of my life that needs to be brought to light and to be battled for change. I have contacted many friends who I love and respect asking them to hold me accountable and to also partner with me in eradicating sarcasm from our ministries and from our lives. Will you too choose to stand and fight for change?